It was falling heavily, and daylight was fading fast, but we had to pay our respects at the monument to the 7th Michigan Infantry Regiment. 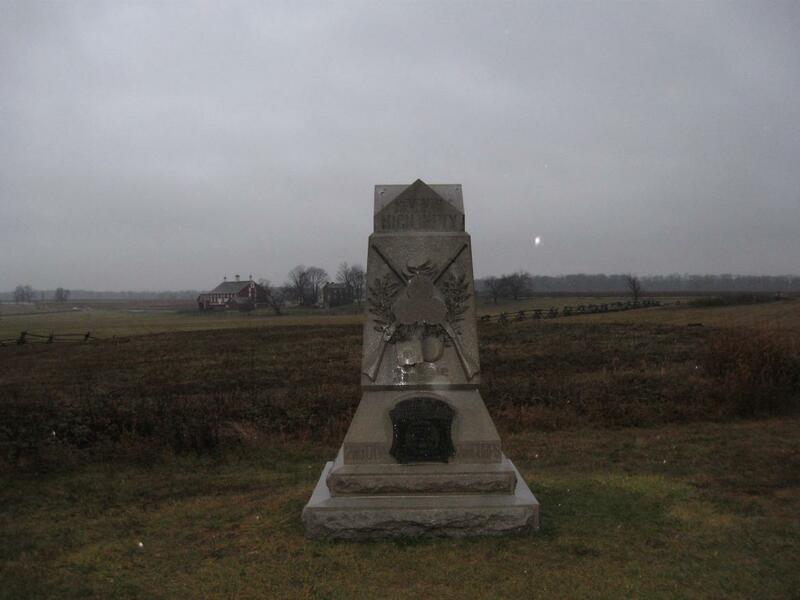 Today it is located in the High Water Mark area where it helped repulse Pickett’s Charge on July 3, 1863. 146 years ago today, however, it was on the offensive, trying to quickly paddle across the Rappahannock River at Fredericksburg while being fired at by a well-sheltered Barksdale’s Mississippi Brigade. The Codori Farm is in the background. The white splotches are raindrops. This view was taken facing west at approximately 4:30 PM on Thursday, December 11, 2008. 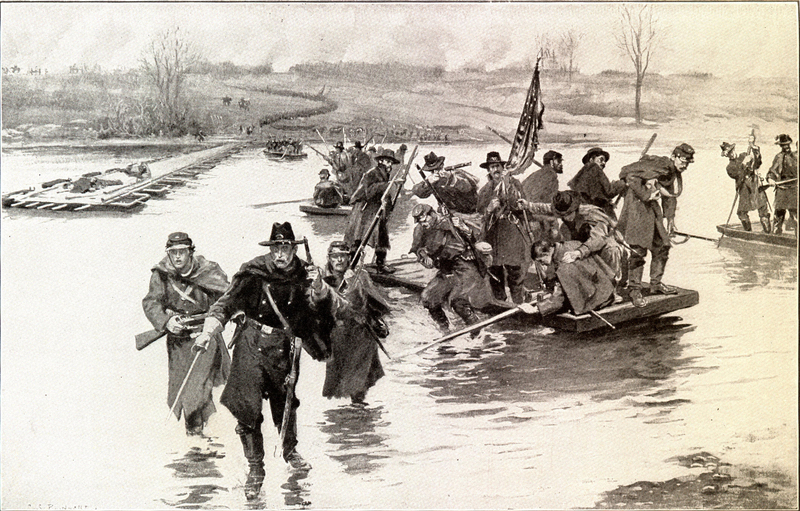 Early in the morning of December 11, 1862, the 7th Michigan Infantry Regiment (or their commander(s) volunteered to jump into pontoon boats, and row themselves across the Rappahannock River to Fredericksburg, Virginia while under fire. Waiting for them on the Fredericksburg side was William Barksdale’s Mississippi Brigade, which had barricaded themselves in structures and in rifle pits along the banks of the river. A man standing nearby reportedly overheard Burnside saying something to Brigade commander and former 7th Michigan regimental commander, Colonel Norman J. Hall that “the effort meant death to most of those who should undertake the voyage.” The commanding general then added, “If any should cross under the conditions it would be one of the greatest feats of the war.” The 7th Michigan quickly rowed across the river, and established a bridgehead for a significant portion of the Army of the Potomac to make its way across. 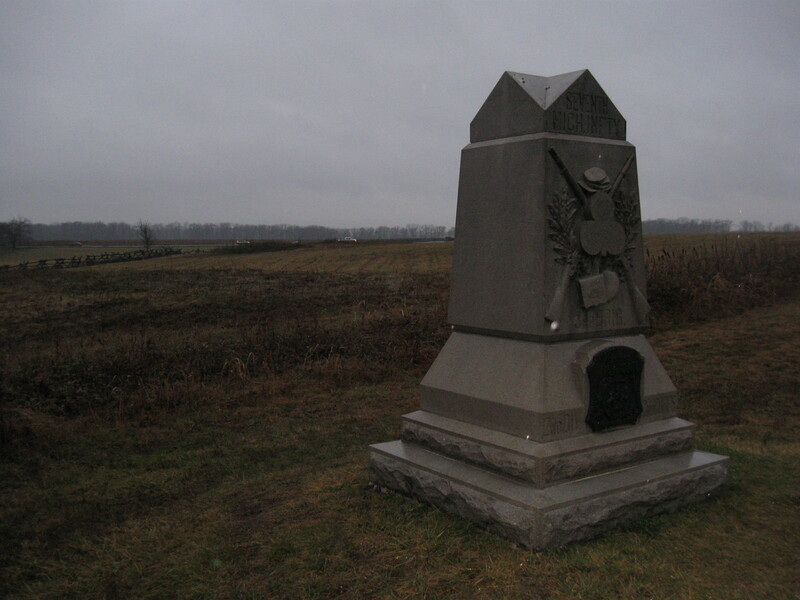 For this action, the 7th Michigan was nicknamed the “Forlorn Hope Regiment.” Lieutenant-Colonel Henry Baxter, who was severely wounded in the left shoulder in this assault at Fredericksburg (his third wound of the war) would be a Brigadier-General at Gettysburg. His brigade surprised Iverson’s North Carolina Brigade on July 1, 1863 on Oak Ridge. Baxter would be wounded a fourth time at the Wilderness in May, 1864. 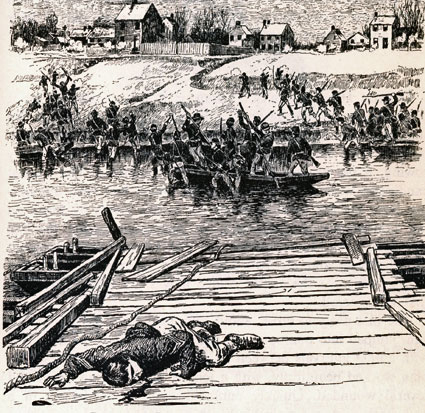 At Fredericksburg on December 11, 1862, the Union engineers were to lay pontoon bridges across the river. Barksdale’s Mississippians began to pick them off, and according to one Union officer, “the engineer troops, failing to perform their part, running away from the boats at the first fire from the enemy and seeking shelter.” In actuality 50 of the engineers had been killed or wounded. Lieutenant-Colonel Henry Baxter (at Gettysburg a Brigadier-General in Robinson’s Division of the First Corps) volunteered his 7th Michigan to row across the Rappahannock to establish a bridgehead. 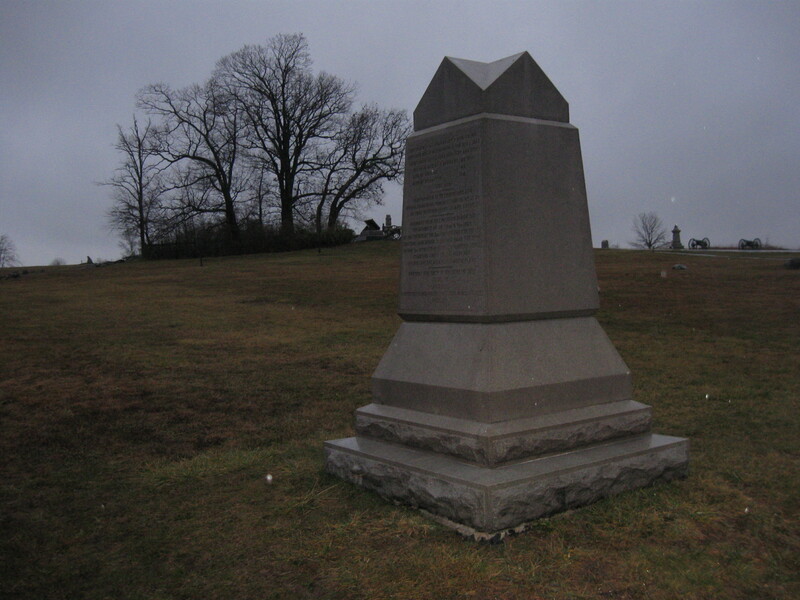 The 7th Michigan Monument, located southwest of the Copse or Clump of Trees, was erected on June 12, 1889. This view was taken facing northeast at approximately 4:30 PM on Thursday, December 11, 2008. 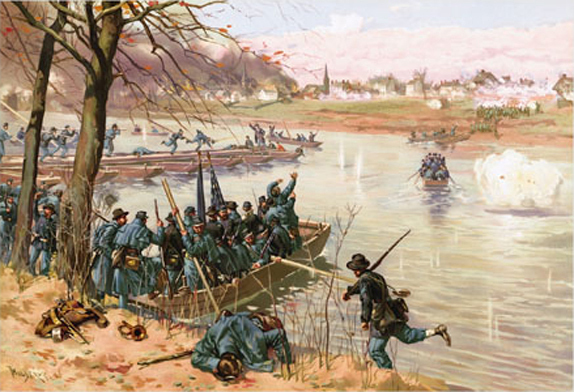 The 7th Michigan formed under the Fredericksburg bank of the river, and rushed up Sophia Street so rapidly that 31 Mississippians were captured. This view was facing northwest at approximately 4:30 PM on Thursday, December 11, 2008. 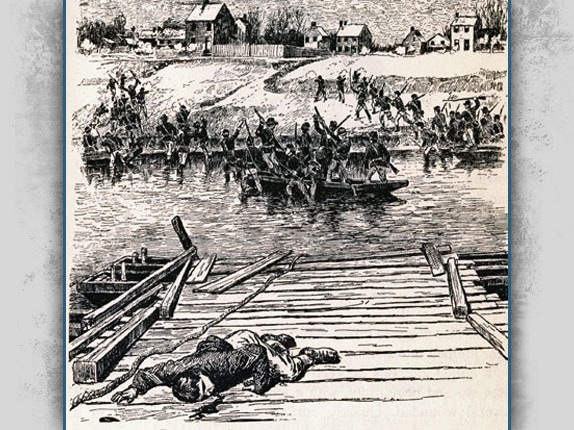 The bridgehead at Fredericksburg was established, the pontoon bridge completed, and other Union units began to cross and clear the streets of the city. The 7th Michigan attacked the well entrenched Confederate position at Marye’s Heights on December 13th. 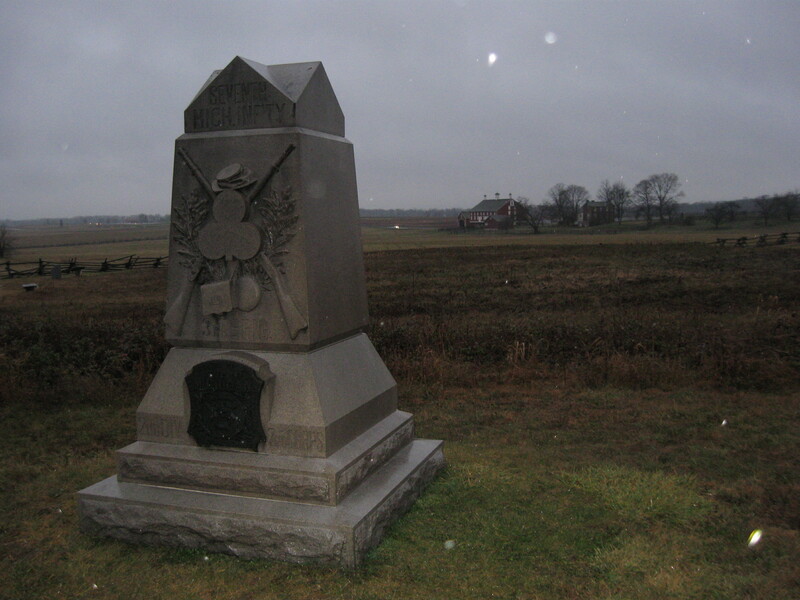 Total casualties for the 7th Michigan at Fredericksburg was seven killed, 24 wounded, and two captured/missing. Major Sylvanus Curtis described the 7th Michigan’s efforts in the repulse of Pickett’s Charge on July 3, 1863 at Gettysburg: “The enemy continued to advance boldly until within 30 or 40 yards of our line, where, partially protected by rocks and shrubs, they continued to pour in a galling fire. The artillerymen belonging to the batteries being nearly all killed or wounded, the guns were silenced. Advancing boldly to the battery on our left, the enemy took possession, planting a battle-flag upon one of them. Their triumph, however, was short. A deadly volley was poured upon them at not more than 30 yards distance. Their color-bearer fell, pierced by a dozen bullets. Many others were killed or wounded, and they were forced to fall back to their cover, and the battery was saved. During the hottest of the firing many of the enemy were seen to throw down their guns, and, creeping along the ground to our lines, surrendered as prisoners. The enemy, failing most completely in their attempt to carry our line by assault, retreated in considerable disorder.” At Gettysburg, the 7th Michigan consisted of only 165 men and officers. 21 were killed, and 44 wounded for a loss of 39.4%. This view was taken facing southwest at approximately 4:30 PM on Thursday, December 11, 2008.